On 11 December 1848, Louis-Napoleon Bonaparte was elected (the first, and only) President of the Second Republic, by universal male suffrage. It was from the Elysée-National (the Elysée Palace, chosen by the Assembly to be the official residence of the President of the Republic) that the future Emperor prepared the coup d’etat of 2 December 1851. The dissolution of the Assembly and the announcement of a new constitution were the first steps towards the re-establishment of the Imperial regime which would happen a year later. In effect, the Sénatus-consulte of 7 November 1852 was promulgated on 2 December having obtained a favourable plebiscite on 21 and 22 November. From 1852, Gustave Le Gray (1820-1884) was officially commissioned to photograph the Prince-President in his march towards the Empire. The work presented here would become the first official portrait. Compensating for the simplicity of his bourgeois attire, the future Emperor strikes a pose, sitting upright, thus offering the image of an assertive man. The photograph was most likely taken at the Palais des Tuileries, the Prince-President’s home from January 1852. This portrait is a salt paper print produced from a paper negative, a technique that unlike the daguerreotype, allowed for reproduction. Le Gray was also an innovator in this new science. He not only improved the receptiveness of paper negatives to fine detail quality by waxing them before exposure, he also published a paper in 1850 outlining a method known as collodion, which would later be perfected by Frederick Scott Archer (in 1851), which allowed for much shorter exposure times and greater detail. With an economic and political environment favourable to artistic development combined with an increase in the market for public and private images, the second half of the 19th Century would see a revolution in the use of photography. 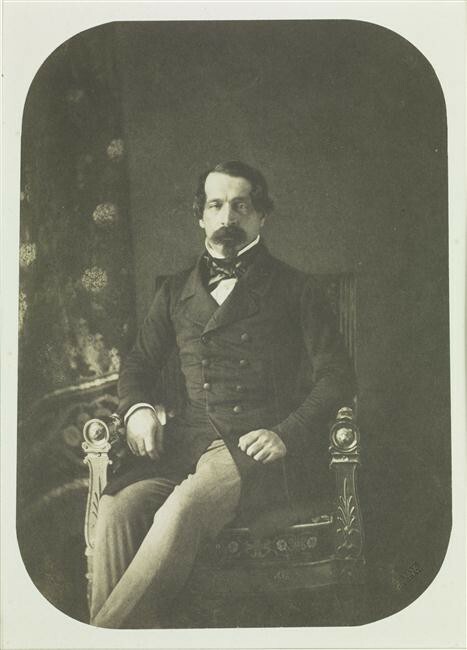 The Prince-President (by then, the Emperor), who was sensitive to the development of industrial and artistic techniques, did not miss the opportunity to use photography as a means of propaganda, political as well as dynastic: whether it be portraits of the imperial couple , or of the heir, the Prince Impérial, photographic documentation about heritage (scientific missions in France and Europe) as well as the camp of manoeuvres of Chalôns, Imperial voyages, albums of portraits of dignitaries (album of the members of the Congress of Paris, 1856). An exhibition online, Gustave Le Gray.